The Prius V is the largest and most spacious model in Toyota's growing family of Prius hybrid vehicles, and is meant to be an alternative to SUVs. Even with its larger size and commendable cargo space, the 2013 Toyota Prius V offers impressive fuel economy of 42 mpg combined. Prius V is a great choice for those who want a vehicle that offers lots of room and super fuel economy. Those new to hybrids should find assurance in Toyota's decade-plus history of successfully making these gasoline-electric powertrains. The 2013 Prius V's price premium can complicate its long-term value equation compared with equally roomy alternatives. Meanwhile, the new Ford C-Max is a tempting rival with even higher fuel economy. If you need towing ability, look to a small SUV or a stouter wagon such as the Volvo XC70. Changes for 2013 are minimal since the Prius V debuted just last year. A new exterior color called Seaglass Pearl is available, and top-trim Prius V Five models receive a SofTex-trimmed steering wheel. Open the door of the Prius V and you'll find more room than expected. The sliding rear seat offers better legroom than some luxury sedans, and the cargo area can swallow more stuff than a Chevy Equinox SUV. Storage space is not just available - it's ingenious. Nooks are abundant. The front seat folds flat to accommodate long items. There's even space under the rear seats for umbrellas. The front of the Prius V's cabin feels roomier than that of the traditional Prius thanks to an open center stack. The available SofTex interior material is easy to clean and made to resist spills. The 2013 Toyota Prius V is instantly recognizable as a Prius, even though it doesn't share any sheet metal with the standard version of the hybrid. What most sets the Prius V apart is its rear, which trades a sloping hatch design for a more bulbous back. The Prius V probably won't win any automotive swimsuit contests, as function takes priority over form here. At least the rear spoiler imparts some zest. Prius V Two and Three models ride on 16-inch alloy wheels, while the top-line Prius V Five comes with 17-inch versions (there are no "One" or "Four" trims). Because it uses the same powertrain and is built on the same platform as the standard Prius, there's little surprise that the Prius V feels similar to its slightly smaller sibling. Because the Prius V is larger and heavier, it's a tad slower, but quick acceleration and the ability to carve mountain roads have never been the Prius hybrid's forte, nor something its drivers expect. But don't sweat: Getting up to speed on freeways is no problem, especially when the 2013 Prius V is in Power mode. The hybrid's transitions between electric motor and gasoline engine remain refined, as does the Prius V's regenerative braking system. Both take some time getting used to, but the adjustment period is short and well worth the fuel savings reaped. The 2013 Toyota Prius V has a Manufacturer's Suggested Retail Price (MSRP) starting at $27,410. A top-trim version reaches over $36,000 with the tech package. The Prius V's base price is higher than that of the slightly smaller but more fuel-efficient Ford C-Max hybrid. The Volkswagen Jetta SportWagen TDI, meanwhile, can attain up to 42 mpg on diesel fuel and also has slightly lower starting price, albeit with a manual transmission. Be sure to check the Kelley Blue Book Fair Purchase Price to see what others in your area are actually paying for the 2013 Prius V. We expect the Prius V's resale value to hold up quite well over the years. The 2013 Prius V comes in three trims: Two, Three and Five. A base model Two is well equipped with automatic climate control, 6-speaker AM/FM/CD audio system with auxiliary input and 6.1-inch touch screen, backup camera, remote keyless entry, and five cup holders. Safety components include stability control, traction control, and anti-lock brakes. Prius V Five models up the ante with the Entune infotainment system with navigation, heated front seats, LED headlights, and integrated fog lights. Major options for the 2013 Prius V come in the Advanced Technology Package, only available on the top-line Prius V. The package includes panoramic (but non-opening) moonroof, premium JBL audio system, dynamic radar cruise control, 7-inch touch-screen display, and a system to help with parallel parking. Versatility is the name of the game for the Prius V's interior. The rear seats slide to create legroom for passengers or space in the cargo bay for your gear. In addition to folding in a 60/40 split, the rear seats recline. Need to carry a long item like a surfboard? The front passenger seat folds flat, too. With this high-tech system, you can connect a smartphone via Bluetooth or a cable and then perform tasks such as ordering movie tickets or listening to Internet radio using your voice or the vehicle's controls. 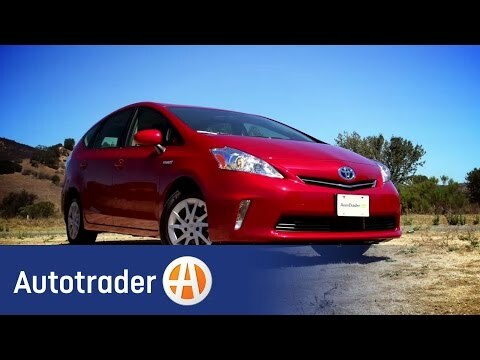 The 2013 Toyota Prius V hybrid is powered by a 1.8-liter 4-cylinder gasoline engine matched with a 60-kilowatt electric motor, sending power to the front wheels through a gearless, continuously variable automatic transmission (CVT). Except for a slightly revised CVT to accommodate the added mass, the Prius V's powertrain is the same that powers the Prius. The 2013 Prius V is the big papa in Toyota's growing Prius family. The Prius V uses the same powertrain and has similar looks as the regular Prius 4-door hatchback, but offers a larger cargo hull that Toyota boasts is roomier than that of many small SUVs. The "V" in this 5-passenger hybrid stands for "versatility," and it aims to offer just that for families or those who need room to haul their stuff but cringe at the notion of doing it in a thirsty SUV. The Prius V is a tad slower than the traditional Prius but offers a smoother highway ride and innovative rear seats that slide, fold and recline. Above all, the Prius V is fuel-efficient, with a 42-mpg combined city/highway rating. Did we like it? We did - we were impressed enough to name this Prius one of the 10 Best Family Cars of 2013. Prius-V drives like a spaceship and has great gas mileage. It has really great gas mileage, which goes without saying. It is really comfortable and it is perfect for me size-wise. It seats 5 people and it has a pretty big trunk, yet I can still fit it in compact size parking spaces. The car drives so smoothly; my friends and I call it a spaceship! Reliability is the only problem that I have had. Not often, but it had an issue where it just shut down in the middle of the road. It was an issue with some wires in the above-head lights. It has since been resolved and I have had no issues from then on. I frequently use the Bluetooth feature, which is great. The maps feature is a bit hard to use at times but it comes in handy when you do not know where you are going and your phone is dead. I am not sure if it is my fault or not, but the sound quality/radio reception is not the best. It sounds fine when I am in my car, but I always seem to notice the difference when I am in someone else's car. Toyota is great, too. They perform basic service on the vehicle for free and the staff there is always great. Prius v, great space less comfort. (2013). Great mileage for a vehicle with as much cargo space as this car has. It is well equipped, though because it is a 2013, it lacks the newer safety features which are now available. Personally I would have to think twice about a repurchase, as it is lacking in luxury even with a package 5. My two biggest complaints are the poor insulation from road and wind noise and the uncomfortable ride. This is not an inexpensive car and as such I expect more creature comforts. I have experienced back issues as a result of repeated 5 hour rides in this car so driver comfort must be addressed!! I have not had mechanical issues with this model but be aware that repairs on this vehicle tend to be pricey, especially items related to the electrical system and the batteries!! I love my Prius v, however I would like a better voice command system and more trunk accessories. The voice command hardly ever recognizes my contact names. The trunk is spacious but I cannot attach any trunk organizers as it does not have many hooks. It drives well and saves us lots of money on gas. I truly enjoyed the free XM radio for a year!